Looks like Microsoft does have a sense of humour after all or at least a sense of community. The Internet Explorer Development Team at Microsoft has sent Mozilla a cake to mark the release of Mozilla Firefox 3. Al Billings, who was at one part a member of the Internet Explorer Development Team, is pictured on his blog holding the cake. Microsoft did this previously when Mozilla released Firefox 2. 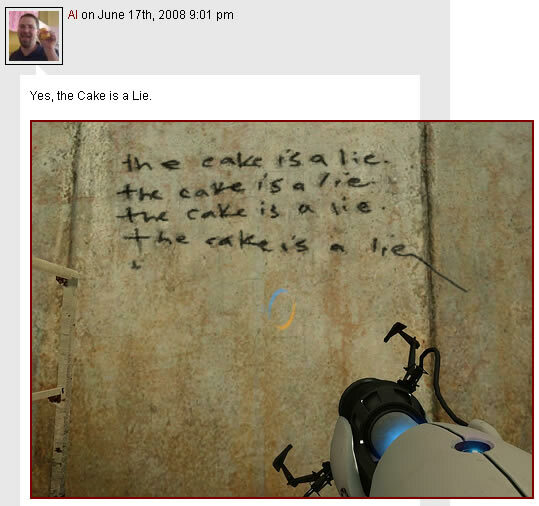 Funniest part about this is Al posted a comment latter, see image below, saying “Yes, the Cake is a Lie.” and including a screen shot of writing on the wall from Portal. Watch out the for the Weighted Companion Cube, it may be plotting to stab you. This entry was posted in Software / Applications on June 19, 2008 by JAB_au.